Twenty-year-old Jordan Spieth is making quite a bid to become golf’s youngest major champion in more than 80 years. AUGUSTA, Ga. — Even without golf’s biggest star, this suddenly is shaping up as a Masters for the ages. Jordan Spieth, playing a brand of big-time golf that belies his 20 years, kept his cool amid the chaos of Saturday at Augusta National. He was too busy trying to handle a lightning-fast golf course to even look at a leaderboard until he couldn’t avoid them over the closing holes of a wild round. 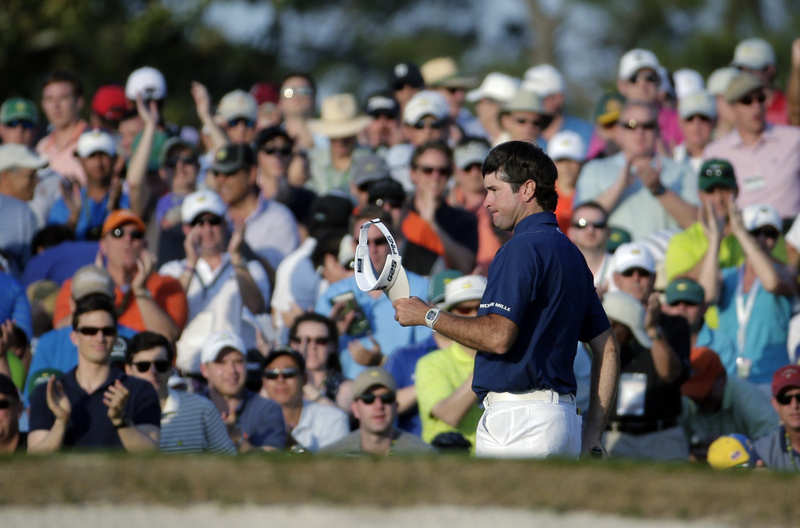 The Associated Press Spectators cheer as Bubba Watson walks up the 18th fairway during the third round of the Masters golf tournament Saturday in Augusta, Ga.
His name at the top with Bubba Watson was compelling enough. It’s been 83 years since a player this young won a major, and 35 years since anyone won the Masters on his first try. Two shots behind was 50-year-old Miguel Angel Jimenez of Spain, rattling off seven birdies for a tournament-best 66 that gave him a shot at becoming the oldest winner in 154 years of championship golf. And still very much in the picture is Fred Couples, the 54-year-old who won his green jacket a year before Spieth was born. The only mention of Tiger Woods, absent from Augusta National for the first time in 20 years, was whether Spieth could replace him as the youngest Masters champion. Spieth managed one last par from the deep fairway bunker on the 18th hole for a 2-under 70. In his first Masters, he has broken par all three rounds. That gave him a share of the lead with Watson, whose five bogeys in a round of 74 brought so many players back into the mix. Watson had a three-shot lead at the start of the third round. When he walked off the 18th green with a par, nine players were separated by three shots. Spieth and Watson were at 5-under 211. Woods was 21 when he won his first Masters title in 1997. Spieth would be the youngest major champion since Tom Creavy, who was a few months younger than Spieth when he won the 1931 PGA Championship. But there’s a lot of traffic on the road to a green jacket, mostly because of Watson. He stretched his lead to five shots with a 7-iron to 6 feet for eagle on the second hole. He made only one birdie the rest of the way, a round sprinkled with putts either too hard or left woefully short. Even so, the former Masters champion was right where he wanted to be. Matt Kuchar, who squandered chances to win each of the last two weeks, hit a pitch from well behind the 15th green that had to be perfect and was, setting up the best of his six birdies in a round of 68. Kuchar was one shot behind along with Masters rookie Jonas Blixt, who fell out of the lead with a bogey on the 17th and shot 71. Jimenez, who finished his round about the time the leaders teed off, was two shots back at 3-under 213 with Rickie Fowler (67). Lee Westwood, in that small class as the best players without a major, had a 70 and was at 214 with Jim Furyk (72) and Thomas Bjorn (73). That wouldn’t include defending champ Adam Scott, who might have thrown away his hopes with a 40 on the front nine that led to a 76. He was six shots behind. Spieth fell in love with Augusta National the first time he saw it last October. He has leaned on two-time champion Ben Crenshaw in practice rounds, and met with six-time champion Jack Nicklaus on Wednesday to learn as much as he could. Spieth didn’t even have a PGA Tour card at this time last year. Since then he won the John Deere Classic, became the youngest American to play in the Presidents Cup when Couples made him a captain’s pick, and had a chance in the final hour to win the FedEx Cup and its $10 million prize. Now the young Texan has a good shot to join them in the champions’ locker room.